Media coverage of the campaign - please share! The United Kingdom prides itself on upholding human rights, and respecting every individual’s right to speak freely, but we are allowing sporting events to celebrate individuals who reject British values and are guilty of inflicting human rights abuses upon innocent civilians. We need your help in filing a legal complaint with the UK's authority for the Organisation for Economic Cooperation and Development (OECD), against the Royal Windsor Horse Show’s principal partner Land Rover, main Sponsor Rolex, and event organiser HPower Group. Our legal complaint asks the companies involved to acknowledge the human rights implications of what they are doing, and to put in place human rights policies and engagement processes so that they avoid 'sportwashing' foreign despots' reputations in the future. Please contribute now and share this page on social media to spread the word. Bahrain Institute for Rights and Democracy (BIRD) is a London-based NGO which provides Bahraini victims of human rights abuses with support, resources and helps them obtain justice. We advocate for the UK government to speak up for victims and pressure Bahraini authorities to ensure the safeguarding of basic human rights principles. The Royal Windsor Horse Show is an annual equestrian event at the heart of British life. King Hamad of Bahrain and his son Prince Nasser have been invited to attend this event since 2013, and sponsor four competitions including the famous ‘King’s Cup’. Bahraini flags are displayed at the event and the King's patronage is accepted and encouraged. Peaceful protests at the 2017 event were stopped by Bahraini security personnel, while in Bahrain relatives of UK-based Bahraini campaigners were detained and interrogated by the police during the day. They were told to call their relatives in the UK and to tell them to stop any protests. They were released only after the race events had finished. We want to hold the organisers - HPower Group – and the key sponsors (Rolex and Land Rover) accountable for the negative human rights impact of the race and ask them to put in place processes to stop this happening again. King Hamad of Bahrain should not be a guest of honour at the event while pro-democracy movements are violently suppressed in his own country. We are starting with an initial amount of £2500 to help to cover the cost of submitting a complaint against the three companies mentioned above, to the UK's National Contact Point (NCP) for the OECD Guidelines on Multinational Enterprises, which regulates the human rights impact of corporations. If accepted, the NCP will arrange a mediation with the companies or will deliver its own judgment on their activities, which is reported in Parliament. Human rights defenders, political dissidents and the general population of Bahrain suffered from extreme abuses such as torture, unfair trials and execution during 2017. The prominent activist – Nabeel Rajab – was jailed for 5 years for sending a tweet deemed to be insulting of the royal family. Please help us to stop these companies giving a platform to the Bahrain authorities with no questions asked. 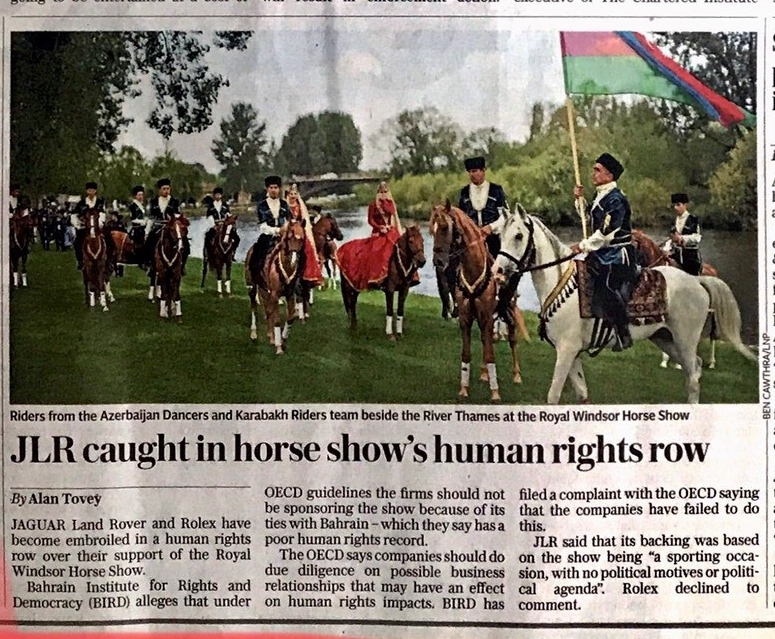 The Royal Windsor Horse Show should stop giving King Hamad a free pass for human rights abuses. Our case has already been covered in the Sunday Telegraph and Middle East Eye. Please share the following on social media and make sure you add the link to the case page - www.crowdjustice.com/case/windsor-horse-show - to spread the word. The MEE article states "Jaguar Land Rover and Rolex face being dragged into an embarrassing human rights row over their sponsorship of the Bahrain-backed Royal Windsor Horse Show." 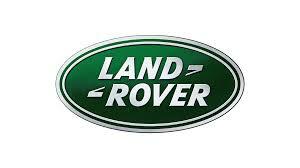 The Sunday Telegraph note that Jaguar Land Rover and Rolex "have become embroiled in a human rights row".